« Common Core Wearing on Ya Yet? What can you do when your character gets questioned but you’re unable to defend yourself? In my new play in the November issue of Scholastic’s Scope Magazine, a peasant in 19th-century France is accused of a crime he didn’t commit. The harder he tries to clear his name, the less people believe him. Does he get what he deserves? 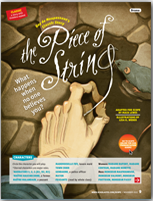 Guy de Maupassant’s classic story, A Piece of String, makes a great characterization activity. Vivid characters, a compelling plot, and a interesting moral make for great classroom discussion. You can get A Piece of String by becoming a Scope subscriber, and you can preview the play here. This entry was posted on October 27, 2013, 12:54 am and is filed under Read-Aloud Plays, Scholastic Products. You can follow any responses to this entry through RSS 2.0. Responses are currently closed, but you can trackback from your own site.